RAINBOWS & UNICORNS! A LISA FRANK STYLED SHOOT WITH FREE PRINTABLE RECIPE CARDS! Well it doesn’t get anymore rainbows and unicorns than this! 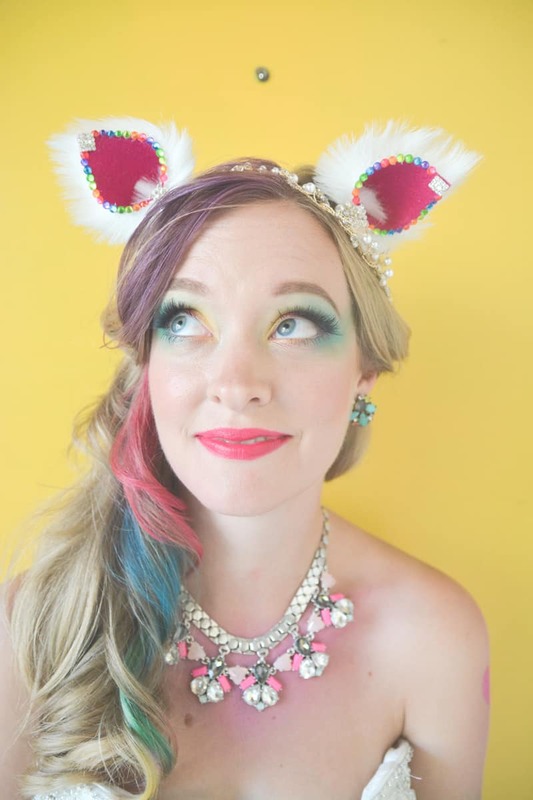 When Schellie and William of Six Hearts Photography told me they had something they thought we might like, I would never have anticipated, cat ears, unicorn hair, candy all the colours of the rainbow, dancing bears and a free printable recipe card for rainbow pasta!! So naturally I just had to ask them how on earth they had come up with such inspiration. “When we first had the idea to do a Lisa Frank styled shoot, we knew we hadn’t seen any weddings online in this style. There was just one portrait created by Lisa Frank of a Cat and Dog getting married that kept appearing, and seems to be her only wedding drawing.” explained Schellie. “Just like Lisa Frank, we love being kids. We felt it only appropriate to have one of the happiest days of your life be extra extra happy and fun.” She added. “When it comes to color, many are afraid and we’re really not sure why? Simply do not be afraid, embrace the color – all the colors, even!” advised schellie. Don’t forget to get your free printable recipe cards from Simply Catering here!